The system is offered with integrated and factory-calibrated highend GNSS/IMU system and camera. The design allows flexible adaptation of these components to specific application requirements. Complemented by a RIEGL data recorder, the RIEGL VQ-880-G is a complete LIDAR system to be installed on various platforms in a straightforward way. The NEW sister type RIEGL VQ-880-GH has been especially designed with reduced height optimized for helicopter integrations. Both systems carry out laser range measurements for high resolution surveying of underwater topography with a narrow, visible green laser beam, emitted from a powerful pulsed laser source. Subject to clarity, at this particular wavelength the laser beam penetrates water enabling measurement of submerged targets. 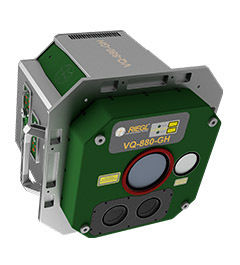 The RIEGL VQ-880-G comprises a high precision inertial measurement sensor for subsequent precise estimation of the instrument's exact location and orientation. A high-resolution digital camera and optionally an additional infrared laser scanner are integrated to supplement the data gained by the green laser scanner. The rugged internal mechanical structure together with the dust- and splash water proof housing enables long-term operation on airborne platforms. Compared with the RIEGL VQ-880-G the new VQ-880-GH is ready for integration of 2 digital cameras.